Music fans were left clamouring for more after an incredible double-bill on Tuesday night, which saw Americana string quartet Laura Cortese and the Dance Cards take to the stage in Mareel’s auditorium with acclaimed folk outfit Drever McCusker Woomble, writes Alex Garrick-Wright. The sold-out crowd were treated to an incredible concert, with both acts playing a full set. The atmosphere was already buzzing with excitement before Laura Cortese swept onto the stage with a smile and a wave. The band dispensed with introductions and let the music do the talking, leading off with the appropriately titled A Low Hum. 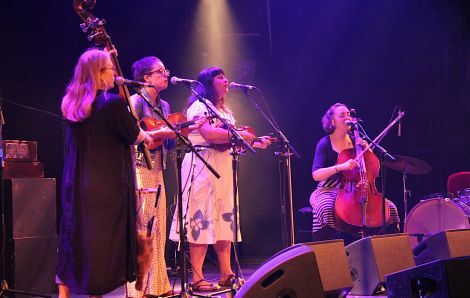 Laura Cortese and the Dance Cards have a difficult sound to pin down – lying somewhere at the cross roads of country and folk (veering occasionally into gospel), while the band’s instrumentals flip back and forth between a cappella and string quartet. Whatever the definition, the music is fantastic. Most of the band’s set list was from their album California Calling, which had come out since the last time Laura was in front of a Shetland audience. Rhododendron was a particular stand out; a soulful vocal number with heavenly harmonies. Heel to Toe, a lively well-named number full of toe-tapping and sheer energy, was also excellent. While the band has played in Shetland on a number of occasions, two members of the new line-up had never been to the isles before. Each member of the band took it in turns to engage with the extremely receptive audience, quickly building a warm rapport with the crowd. “I love this place so much,” Laura said, adding that as an avid fan of BBC’s Shetland (which “soothes the sadness”), she had been particularly excited to come across the show’s star, Douglas Henshall, before the gig. She said she had invited him as a special guest via Twitter. To her (and the audience’s) disappointment, he had to decline. Laura’s love of Shetland has been galvanised, she explained, by the fact that she met her partner – a Belgian musician – on the NorthLink ferry to Aberdeen following the folk festival a couple of years ago. Finishing the set on a song from their as yet unreleased album From the Ashes was a good choice, although the decision for the stage lights to slowly dim until both the band and the audience were in darkness, was a slightly bizarre one. 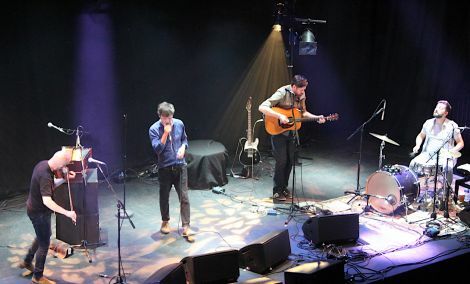 ‘Folk supergroup’ Drever McCusker Woomble were upgraded from trio to quartet with the addition of Louis Abbot (of Admiral Fallow) on percussion and keyboard. No strangers to a Shetland audience, the band soon had everyone whipped up into a great party atmosphere, joking and chatting away almost as much as playing. Singer/guitarist Kris Drever, singer Roddy Woomble and fiddler John McCusker are masters of their art, and in playing through their 2008 LP Before the Ruin they conclusively proved that not only do they still have it, but if anything they have improved over the last decade. With the addition of Louis Abbot, the band was sensational. With all the genuinely funny anecdotes and witty repartee, it was easy to forget how beautiful the music was. A wild story about singer Eddi Reader getting locked out of a Japanese concert hall (and trapped in a shopping centre) while the band strummed impotently on stage, in total darkness, for 10 minutes led into the fantastic Eddi Reader’s Trip to the Mall. Please Stop Playing Your Trumpet was another deep and stirring number inspired by a crazy, hilarious story (in this case, a man at the back of one of their concerts who kept playing along on his trumpet). The highlight of the set was, strangely, not one of the album’s numbers but Kris Drever’s own tune about the scuttling of the German naval fleet in 1918. After some goading from Louis Abbot (who claimed that the normal introduction to the song was a solid nine minutes of historical context), he explained the story of how the German fleet, kept in Orkney’s Scapa Flow, sank itself overnight as a final act of defiance after the Armistice. The song, commissioned by the BBC “because they couldn’t think of anyone else from Orkney”, was a wistful and absolutely stunning retelling of the story that completely enchanted the audience. The audience, for their part, loved every second. The quartet knew how to work the Mareel crowd and were rewarded for it with raucous applause and devoted attention. They barely made it off stage before returning for the encore – as if anyone suspected they wouldn’t have one. The final number to close the night, Waverly Steps, was one of the more energetic tunes of the set. Seeing one of these bands would have been a treat. Seeing both, on the same bill? Unbelievable. Every member of the audience must surely have savoured every second of it, knowing full well that they’ll not see another concert of that calibre any time soon.